I was just about to sleep when I decided it’d be best to put into writing some pressing thoughts I have been thinking concerning random issues. A lot has been going on in the community these days and everybody finds certain news too redundantly mentioned that it is getting difficult to put them off that easily. It is a little depressing to think about our nation’s current political situation. Being hailed to be one of those at the top in terms of corruption, the Philippines has been ardently fighting against it to regain its dignity among other nations. Despite the attempts, there seem to very little progress. People are trying to hold on to any glimmer of hope they can get from church sermons, Pineda, Peñalosa and Pempenco achievements, and the quite convincing platforms showcased by our current presidentiables. At times we rely on the little comfort we get from denying the sad facts at hand and quietly telling ourselves that “things will change for the better”. But, will change really come? And if it comes, will it be for the betterment of the country and its people? I myself took a little time to discover truths about our country’s candidates for the presidential post. 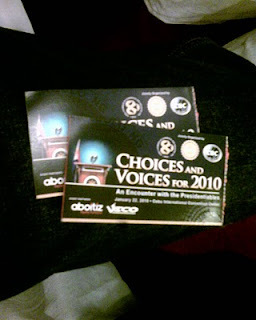 I have attended the recent Choices and Voices for 2010 held in Cebu International Convention Center (thanks to Cebu’s Chambers of Commerce and Industry) and attended IVCF-CEV’s lecture about responsible voting. In these participations, I found out bits of information about the candidates. I am glad to have heard the candidates speak about their platforms and plans for our government, too. Each one determined to win the Filipinos’ heart by promising solutions on poverty, injustice, and freedom from corruption. Just as I have heard their promise-filled speeches, I also learned their weaknesses brought up by the people who questioned them during the forum. Banters on Noynoy opportunistically riding behind the given popularity of his parents being renowned country leaders in the past and his involvement in the age-old Hacienda Luisita controversy were hot discussions. Fears of Gordon’s tendency to become a dictator following Ferdinand Marcos’ footsteps, Gibo’s questionable loyalty to the administration and his inability to have a solid stand on certain issues concerning President Arroyo’s reported governance oversights and lapses were repeatedly asked. Erap himself couldn’t seem to justify clearly the cases filed against him during his short-lived reign as the country’s president jokingly entertained the audience by responding “I’ve been there” to the questions raised against him. All brings us down to the question, “Would we want to entrust authority to these individuals?” Why not cast our vote to Villanueva who claims that righteousness will remedy these problems? Unfortunately, for him, Christians find it odd to hear news of his supposed support to party list LADLAD’s cause. Villar’s shout out as “tunay na mahirap” might sound very appealing but questions of him spending millions for his campaign seem to become an issue. Jambi, Perlas, and de los Reyes’s lack of solid track record in higher office seem to be resoundingly countering their efforts to market themselves. These propagandas about them emphasize the negative. I’m sure they do have good intentions too. They wouldn’t put their reputations at stake for defamation or disgrace. I’m sure they ardently advocate good causes. If we effort on doing our own personal research not only finding the negative news but also fairly seeking the good information about them, we will arrive on an unbiased and well-informed decision. If we are able to do this, then we render value to our votes. This is the least we can do to contribute in making our country recover from pits of shame and further corruption. So if I be asked again “will there be changes after the election?”, I am sure there will be. As for whether it be for progress or regress, I’d let time tell. For now, I’d like to be certain that I’ll get past elections guilt-free by casting a wise vote. Anyone else can do the same! Quite related to the dilemma on elections, I have also been made conscious about our ability to contribute to the preservation of Blue Fins and other extinct fish species. End of the Line was a very informative documentary. It narrates in vivid video footages how certain fish types are rapidly becoming extinct. Certain populations of fish species have been reported to have declined substantially since 1950. The video ended reminding people to be conscious on what type of fish to buy. If it belonged to a class that is extinct or endangered, it was advised that we can contribute by not patronizing these products until their population recovers. Marine preservation was also encouraged while fish farming using a large quantity of small fish to serve as bait for the large ones was discouraged. 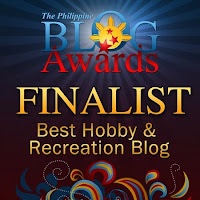 Sharing this documentary and information dissemination via blogs could be a good start. Chile shook after an earthquake with a magnitude of 8.8 hit the country. Philippines is said to experience a magnitude of 1 anytime soon. Events like these make me think that most things are really uncertain. We are at the mercy of a God who makes our protection and salvation sure. I have lived through a long battle of disbelief in the past because I couldn’t buy the idea of believing on something or someone I couldn’t see. But the thought of rendering life meaningless due to death is far unbelievable. I began thinking that I haven’t been given life only to die and be inexistent and forgotten. Life must continue after death. The existence and concept of a Creator and eternal life or eternal damnation fits the void about living and dying. There is a God! At the end of the day, everyone returns to self. How am I living my purpose? Am I making a difference? Did I do any good? Did I make God smile? Concerns and issues keep coming. They come in many varieties. Worries about life and one’s interaction with the people and the rest of the creation around him makes the frequent visits. Sometimes I worry about my ageing parents and how their health is becoming worrisome. Marriage, investments, properties, and work add to my anxieties. Peer and parental pressures make it even harder. At the end of all these, however, you have only yourself to decide and (a) God to confer with. Although we rely on Him for guidance, but it is the times when His grace makes the hard decisions for us that are the sweetest. Nevertheless, there are major parts of life where he chooses to be silent and watch you apply what you have learned all throughout these years. Every obstacle and every difficulty serve to strengthen. For every decision, never fail to allow God’s intervention. It is when we think we don’t need him that we in fact need Him the most. Face your fears bravely knowing that God and you face it both at the same time. It’s 10:14 pm. This will be my most restful bedtime in almost a year. Sometimes thinking aloud makes the most part of release and recovery. You too can find the time... type your thoughts.